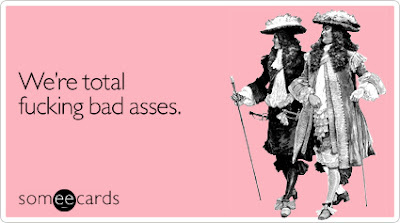 The internet is such a fabulous place to waste an afternoon. While perusing the displays at Tiffany&Co, reluctant boyfriend in tow, I was drawn to the simplest of designs, the Tiffany silver Bean. My astute boyfriend displayed surprising confusion as to the significance of the Bean. Sadly, I had no good explanation at the time aside from girly exclamations such as, "Well, I like it!" or "...because it's pretty!" Determined to come up with a better comeback, I did a little research. 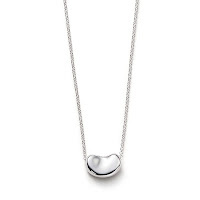 The Tiffany bean was designed by Elsa Peretti, known for the fluid lines, sensual forms and graceful timelessnes of her pieces. Just as Chanel never forgot she was a peasant, Peretti still wanted to remember the simple things in life. Her beans are ordinary in shape, yet extraordinary in their craftmanship. They are beautiful to look at and beautiful to touch. 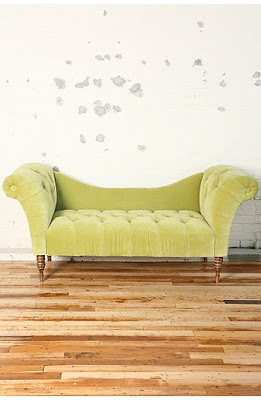 Cliché yet classy in that subdued simple-yet-elegant sort of way. There are few culinary creations more satisifying than good old-fashioned comfort food. With the weather getting cooler by the week we turn now to an American classic: mac&cheese. 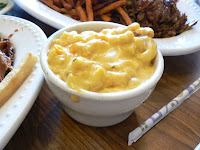 Another spot for some great mac&cheese is Zon's in Jamaica Plain. The farfalle with farm house cheddar and fontina arrives hot, gooey and very rich. It is a perfect dish for a winter night, but probably a little heavy for the warmer months. For a quick bite, Soul Fire BBQ in Allston makes some great fried mac&cheese balls. Dip these delicious munchies into any number of BBQ sauces (or just plain ketchup!) 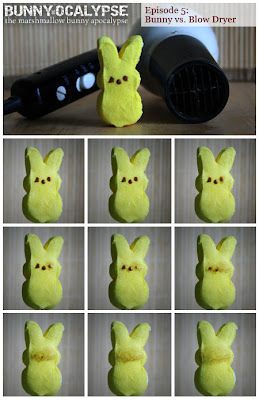 If you can make it past the concept, these munches are fabulous and worth every greasy penny! Picco's in the South End. The penne with cheddar, gruyere and taleggio cheese baked to order and topped with Parmigiano Reggiano looks as good as it tastes. Add in the wild mushrooms and this dish is to DIE for. There are still a few places left try out. 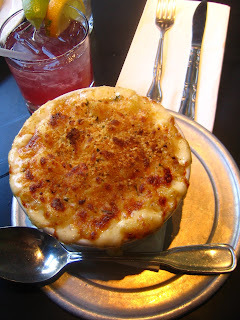 I have heard good things about the mac&cheese at the Alchemist and I'd also like to try out some recipes of my own...if I ever get the recipe *just* right, I'll let you know! A successful day at the South End Market! And by 'successful' I mean it didn't rain and I remembered to bring a sweater. The weather was cool, bright and sunny -- perfect market weather. Friends and family stopped by to say hello and I even sold something at the end of the day! After spending a few hours under the tent of a very friendly etsy-er named Katy, drinking lavender flavored lemonade, munching on pastries from Flour Bakery and catching up on my leisure reading, we all went out for dinner at one adorable little Italian restaurant/ice cream shop in the South End (see more recent blog on Mac&Cheese.) A fine way to end a very fine day! Love the outfits on these guys. Very French. ...can be found on etsy.com! 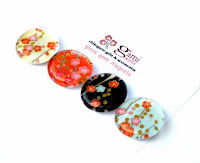 gamiworks makes all sorts of things based on the brilliant Japanese chiyogami (old-paper.) On offer are adorable magnets, coasters, jewelry and other accesories coming in an array of bright colors and graphic patterns. I have also been pretty obsessed with Daughter of Luxury. She has been living in Korea (but will be returning to Canada soon!) and has bought all sorts of amazing beads while abroad. 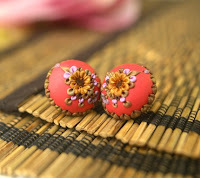 She turns these beads into gorgeous earrings, necklaces and bracelets. And for something really unique, check out Jennifer Morris Beads. 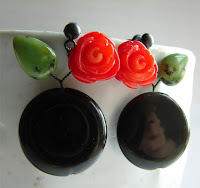 She makes her beads free form out of polymer clay, mixing in 24K gold leaf and sometimes fine silver. You'll also see vintage Swarovski crystals embeded in her gorgeous designs. It looks like she'll be stocking up her shop with some new goodies soon! The Problem: Guests arriving in approximately 1.5 hours. It is Friday at the end of a long, hard week and the last thing you want to do is prepare dessert for all 6-8 people. What's wrong with buying a pre-made pie at the grocery store? The Goal: Mix, bake, frost and garnish a (guest-worthy) cake in approximately 1.5 hours. 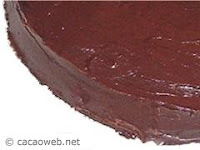 The Solution: Dig into an old edition of The Best Recipe cookbook from America's Test Kitchen and follow the Devil's Food Chocolate Cake recipe with some minor alterations. 8.00pm Dig out old edition of The Best Recipe cookbook. 8.05pm Boil 1 cup of water and gather ingredients. 8.15pm Mix cocoa with water, mix in brown sugar, yogurt and vanilla. 8.20pm Beat a stick of butter with even more sugar then add in two eggs. 8.25pm Whisk flour, baking soda and salt in a bowl. Add (quickly) the dry ingredients to the butter and the cocoa. Cooks Illustrated says to add each component in a third at a time. Assume this is a bunch of B.S. 8.30pm Grease pans and pour in batter. Pop pans into pre-heated oven. 8.35pm Melt *another* stick of butter along with 8 oz of bittersweet baking chocolate over low heat. Let cool on stove. 8.40pm Make up quick and easy simple syrup and blend with a cup of frozen raspberries. 9.15pm Cake that according to Cook's Illustrated should have taken only 25 minutes to bake is now nearly done. Let cake cool on stovetop. 9.25pm Get boyfriend to pour drinks and distract guests while attempting to flip cake out of "non-stick" baking pan. Consider how much easier this would be with a springform mold. 9.30pm. Let cake sit in hopes that it will cool. Grimace at chunk of cake that is still stuck to baking pan that should have been "non-stick." 9.35pm. Pour chocolate butter frosting over still *very* warm cake. Sprinkle on sliced almonds and shove the entire thing into fridge. Hope it will set more quickly this way. 10pm. All guests have arrived and are sipping bubbly. Boyfriend mentions actually serving the dessert. 10.05pm. Cake is sliced, served with (very) yummy raspberry sauce and ice cream. It is all very well received. 10.15pm. Everyone sits around in sugar coma, happy. 11.50pm. Say good night to guests. Leave all dishes for boyfriend to clean up tomorrow. 2. Place thighs in a large bowl and pour the mustard and oil and mix until well coated. Add salt and pepper to the pieces. 3. Dip the chicken in the bread crumbs and place on an aluminum foil lined cookie sheet and bake for 50 to 60 minutes. Note: You can let the chicken marinate in the mustard, oil and salt and pepper for 30 minutes if you have the time. It'll still taste good w/o marinating. 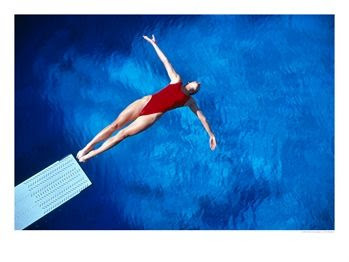 Nearing the end of graduate school is kind of like slowly inching towards the end of a diving board (and by 'end' I mean within the next millenium.) Your toes wiggle forward at seemingly negligible gain. On occasion, fear or plain common sense makes you jump back several feet towards solid ground. The entire time you are on this board, you wonder, is it really worth it? ...let's just hope there's water at the bottom. N.E.E.T. Magazine is filled with all sorts of interesting and funky (occasionally bizarre) clothing, jewelry, home goods and just about anything else the editor feels like picking out. Flip through the online magazine to find something that peaks your interest! NEET = "Not currently engaged in Employment, Education or Training"
In the UK, the classification comprises people aged between 16 and 18 who do not participate in society and who are beyond the scope of labor welfare. In Japan, the classification comprises people aged between 15 and 34 who are unemployed, unmarried, not enrolled in school or engaged in housework, and not seeking work or the technical training needed for work. The ‘NEET group’ is not a uniform set of individuals but consists of those who will be NEET for a short time while essentially testing out a variety of opportunities, and those who have major/multiple issues and are at long term risk of remaining disengaged. Hmmm...so in other words, graduate students? The South End Market this weekend will be particularly exciting because on Sunday from 10am-4pm I'll be there with my very own table! I've made several new necklaces and earrings to show off in addition to the items already posted on my etsy and mintd shops. I haven't been writing much lately (graduate school obligations get in the way far too often,) but that doesn't mean I haven't been thinking of (all 5 of) you who read this blog!!! The Sowa Open Market is open every Sunday through October 28th. From 10am -4pm. The Market is located at 540 Harrison Ave in Boston's South End. Parking and Admission are both free! 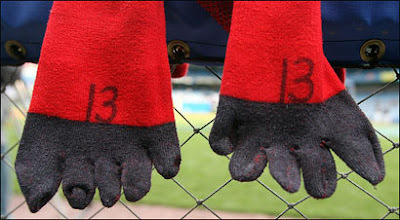 Read more about the 5-toed sock and the Boston Sox at Boston.com. An article in the New York Times caught my eye today. It was about a man who had overdosed on microwave popcorn (in a manner of speaking.) Apparently, prolonged exposure to diacetyl vapor produced from heated synthetic butter can lead to swelling and scarring of the small airways of the lungs. The severe form of the disease is called bronchiolitis obliterans or "popcorn workers' lung," and can be fatal. Patient (jaw dropping): "How could you possibly know that about me? I am MR. Popcorn. I LOVE popcorn." ...and whatever you do, don't inhale. Terry Gross: Did you pattern your makeup on comic book heroes? Gene Simmons: Um...my makeup came as a result of a lot of things, all things Americana. Godzilla, horror movies, science fiction...uh, Black Bolt, which was an Inhumans Marvel comic book, and science fiction certainly. So it's comic books, sort of, all things sort of American pop culture. The rest of the guys in the band had different notions. Paul put on the red lips and the star over his eye as a kind of a exaggeration of what he thought a rock star was, because he always wanted to be a rock star. I was never interested in being a rock star. I always wanted to be Boris Karloff. And Ace -- who's the spaceman in the group, you know -- has delusions of grandeur, and perhaps gravity doesn't quite affect him in the same way, which is to say that he doesn't have good equilibrium, which is a big word, come to think of it. Just like "gymnasium." This is NPR. That's why we're using big words. At one point Terry asks Gene Simmons why he has had over 4,000 exploits with women. He replies very matter-of-factly, "...The first, "man" -- and women -- if man was predisposed to be monogamous, and we all lived in caves at that point, there were one or two alpha males, and the rest were females. Either way, if we were monogamous, within one or two generations, we would all be cross-eyed and retarded. 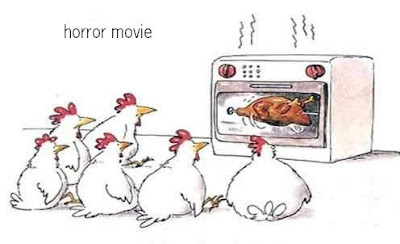 Get it?" Got it. We don't all want to end up retarded. This is about species 'evolution'...which is a big word too. Tired of wearing the same old GAP t-shirt everyone else seems to own? Why not spend your money on something more unique, funky and creative? Threadless T-Shirts is a community-centered online apparel store run by skinnyCorp of Chicago, Illinois since 2000. Members of the Threadless community submit t-shirt designs online, which are then put to a public vote. A small percentage of submitted designs are then selected to be printed and sold through the online store. One of the drawbacks of being a graduate student is the constant need for thrift when it comes to all aspects of life. We seek out cheap (or free) beer, the half-priced appetizers at Happy Hour and shop in the discount section of every store (or at least we should!) So when the mood strikes and I feel like getting a chandelier for my apartment, I won't be going to Neena's. There are, however, some attractive alternatives. 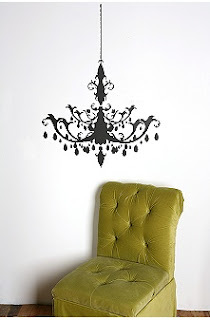 Right now I'm quite taken with the idea of a wall decal. It takes up no space, requires no fixture installation, and can fill up a bare wall rather creatively. Another possibility is this cut out version from Urban Outfitters. It's mod and functional at the same time!